With 2012 coming to a close, we’re reflecting on some of our favorite social promotions from 2012! Here are a few of my favorites. When creating a social promotion it is important to build the idea of the contest around something that will peak your fans’ interest and encourage their involvement with your business. 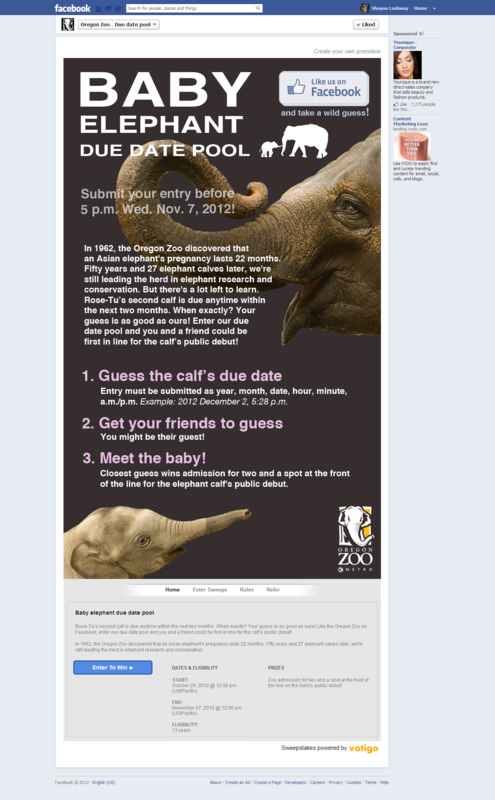 The Oregon Zoo met all of these expectations with their Baby Elephant Due Date Pool Sweepstakes. The promotion was set up in a way to educate fans about Asian elephants and to create awareness for the birth of Rose-Tu’s second calf. 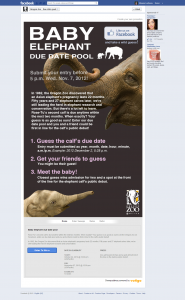 The Oregon zoo discovered that an Asian elephant’s pregnancy lasts 22 months and they encouraged fans to guess the calf’s due date for a chance to be first in line for the calf’s public debut! The Oregon Zoo did a great job building hype and interest around the event of the birth. It is a unique idea to create a promotion around an event that does not have a definite date, allowing for anticipation and excitement. The contest also encouraged entrants to get their friends to guess by allowing each winner to bring a friend to the debut. The lucky winners got to share in the special and memorable event at the Oregon Zoo. Another great promotion that took a fun initiative to engage fans was Chipotle’s Boorito Photo Contest. The promotion had a fun title and a great Halloween design that was eye catching and relevant to the Halloween theme of the promotion. 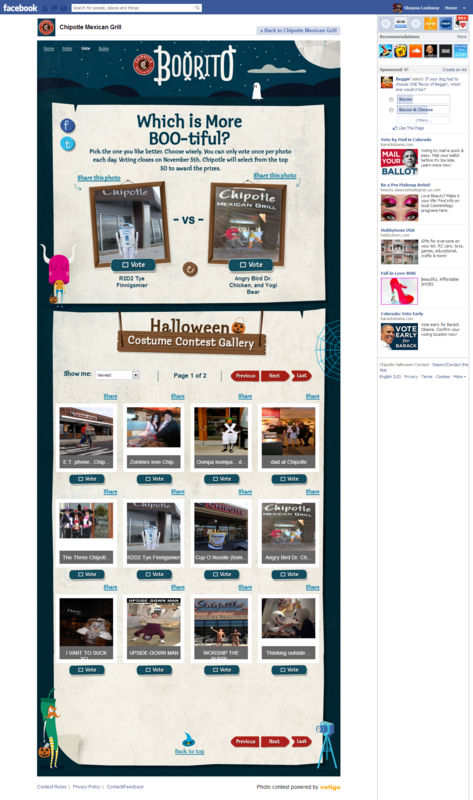 Chipotle asked fans to enter the contest by submitting a picture of them in costume in front of a Chipotle restaurant. This fun idea encouraged fans to visit Chipotle and participate in the Halloween festivities. The promotion created a great way for fans to stay engaged by incorporating a voting process where fans can vote for entries and easily share their favorite photos. The lucky grand prize winner won $2,500, five runner up winners received $1,000, and 20 entrants received the honorable mention prize which consists of a sponsor-specified burrito party at the winner’s select Chipotle Mexican Grill location for up to 10 people. The contest did a great job incorporating a holiday theme into their contest and keeps fans thinking about Chipotle. Often when planning a sweepstakes, the big question on people’s minds is how to spread the message and create maximum awareness. A great example of a sweepstakes that encourages fans to share and spread the message is Olga’s Kitchen Lunch Buddies Sweepstakes. Fans can enter the sweepstakes for a chance to win a year of Olga’s with three lucky friends. Fans are prompted to share their entry with others and receive additional entries for each friend who enters the sweepstakes. By sharing their entry they are increasing their chance to win! 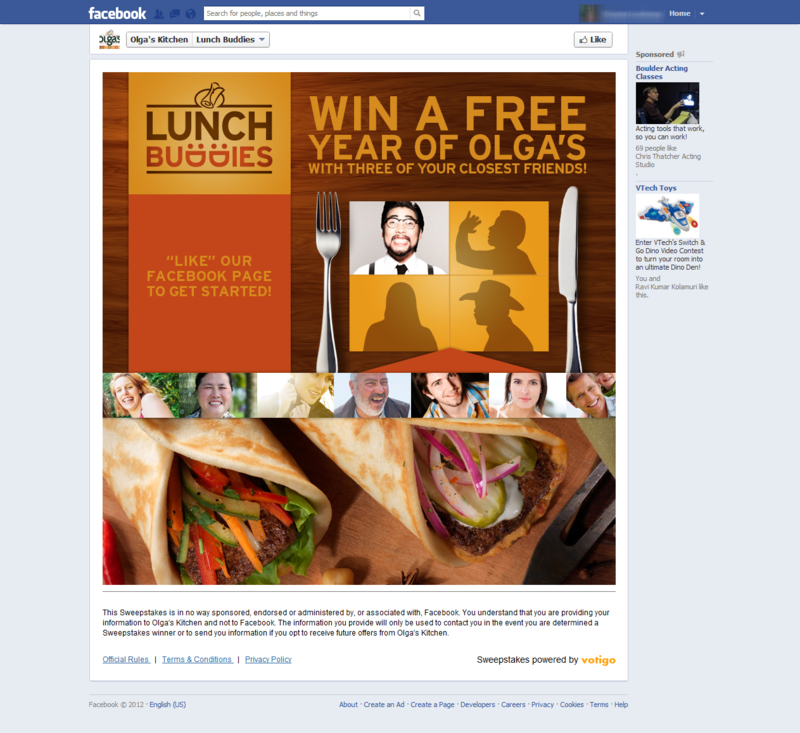 Olga’s Kitchen also requires the entrant to “Like” their Facebook page in order to participate in the Sweepstakes, which allows the entrant to promote Olga’s even before entering. When creating a sweepstakes or contest it is a good idea to create a theme that promotes your brands essence and message. 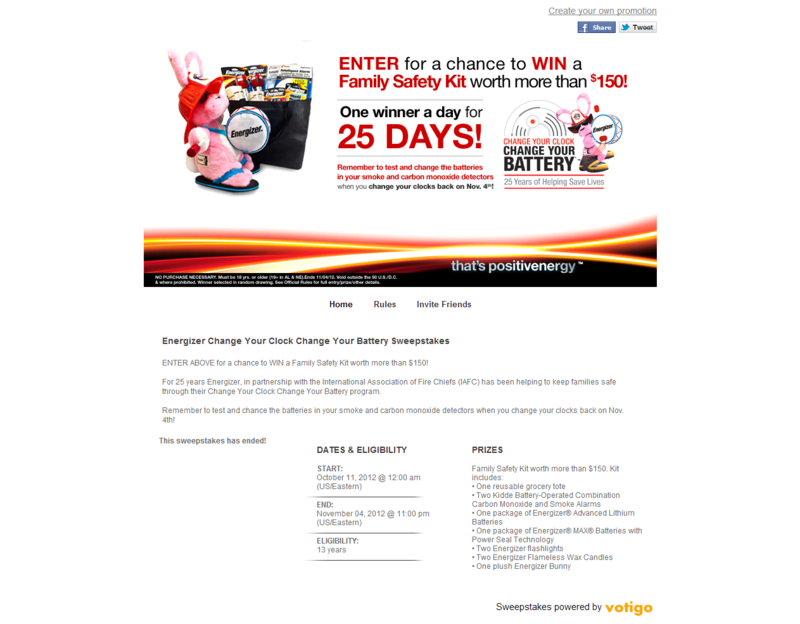 Energizer created the Change Your Clock Change Your Battery Sweepstakes that highlighted safety, a subject matter that Energizer takes pride in and cares about. For 25 years Energizer has partnered with the International Association of Fire Chiefs and has been helping to keep families safe. The sweepstakes promoted important safety tips and encouraged users to enter to win a free safety kit worth more than $150. 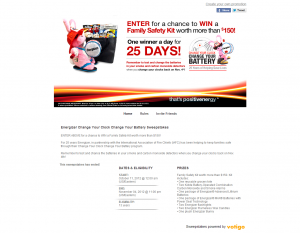 Energizer awarded 25 winners in total who received the safety kit and everyone who entered and visited the promotion had access to all the safety tips provided by Energizer. Another brand that has created a promotion to highlight their brand essence is CITGO with its Fueling Good promotion. CITGO’s central idea is to help change the world mile after mile and each year the CITGO Fueling Good program gives away $120,000 in gift cards to charities in the hope to help ordinary citizens doing extraordinary things for their communities. Twelve charities are selected each year and the exciting part is that fans can vote for their favorite charities. CITGO has created a custom microsite for the promotion where non-profit organizations and charities can register for a chance to win and where users can easily look up charities and vote for their favorites. 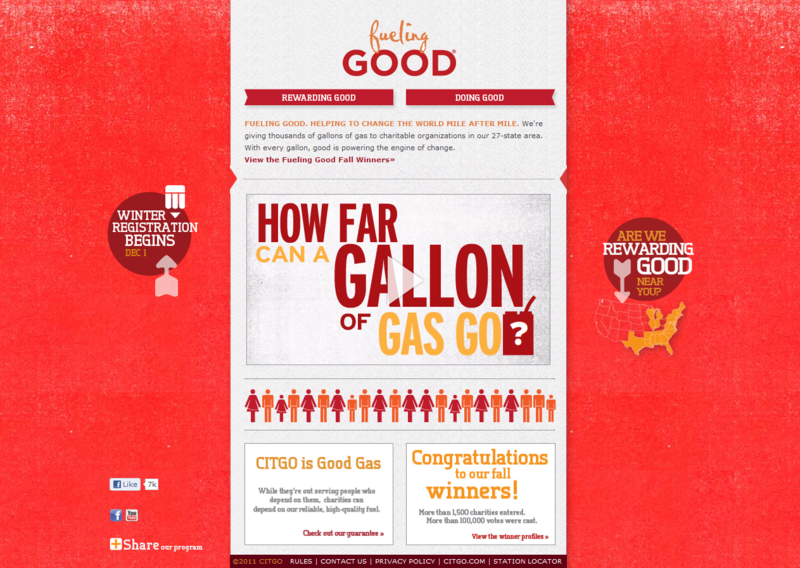 The microsite provides well-designed and informational videos showing how far a gallon of gas can go, inspiring fans to get involved and a vote. Each charity that chooses to register must submit a photo and three essays that describe the service their charity provides, a description of the ripple effect the charity’s good creates in their community, and an explanation of how CITGO gift cards would benefit their charity. 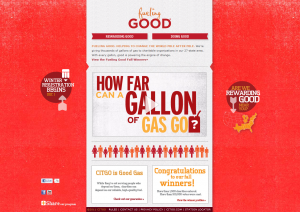 CITGO’s Fueling Good promotion encourages people to give back to their community and to learn more about charities that work to better the world. The promotion runs every year, don’t miss your chance to become involved! These are just a few of the awesome contests and sweepstakes from 2012. I can’t wait for 2013 to see all of the fun and innovative promotions brands run to engage their fans! This entry was posted in Uncategorized by Danielle. Bookmark the permalink.